Postmodernist Style of Architectural Design. For a brief guide to the evolution of architectural design, from Antiquity to Deconstructivism, see: History of Architecture (3,000 BCE - present). 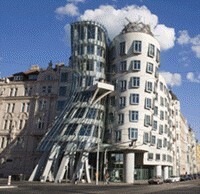 Designed by Frank O. Gehry. One of the most visually striking types of art yet developed, Deconstructivism is a weird-looking but intensely creative style of 20th century architecture that first emerged during the late 1980s, principally in Los Angeles California, but also in Europe. A strand of postmodernist avant-garde art, made possible by the use of design software developed from the aerospace industry, deconstructivist architecture is opposed to the ordered rationality of geometry, preferring a non-rectilinear approach to design which typically distorts the exterior of a structure, subverting modernist values in the process. Some intellectuals believe that deconstructivist philosophy is opposed to postmodernist art as well, although what practical consequences this has is rather unclear. After all, a deconstructivist architect has to obey modernist and postmodernist laws of science whether he/she likes it or not. The most famous exponent of Deconstructivist building design is the Canadian-American Pritzker Prize-winning Frank O. Gehry (b.1929), one of the leading American Architects of the postmodern era. Other deconstructivists include Daniel Libeskind (b.1946), the firm Coop Himmelb(l)au, Rem Koolhaas, Bernard Tschumi and Peter Eisenman. Extraordinary deconstructivist buildings include: Nationale Nederlanden Building (Prague), Guggenheim Museum (Bilbao) and The Experience Music Project (Seattle), designed by Frank Gehry; Hotel Porta Fira (Barcelona), designed by Toyo Ito; Seattle Central Library designed by Rem Koolhaas; and UFA-Palast (Dresden), designed by Coop Himmelb(l)au. (See also Design Art c.1850-1970 and Computer Art: from 1970). Deconstructivism came to public attention as a result of the design entries to the 1982 Parc de la Villette architectural competition, submitted by Jacques Derrida, Peter Eisenman and Bernard Tschumi (who won). Later, in 1988, the Museum of Modern Art staged its seminal New York show entitled "Deconstructivist Architecture", curated by Philip Johnson and Mark Wigley. The exhibition featured designs by Frank Gehry, Daniel Libeskind, Peter Eisenman, Zaha Hadid, Rem Koolhaas, Bernard Tschumi and Coop Himmelb(l)au. The following year saw the opening of the Wexner Center for the Arts in Columbus, the first major public building to be designed in the deconstructivist style by Peter Eisenman. Since the emergence of Deconstructivism, some architects associated with it have moved away or detached themselves from it, but the term has stuck and its iconoclastic design philosophy has permeated contemporary American architecture as well as European designs. Although some experts see a link with Constructivism, the movement pioneered in Russia by the likes of Vladimir Tatlin (1885-1953), Lyubov Popova (1889-1924) and El Lissitzky (1890-1941), others deny any such connection. Still others claim that the deconstructivist movement derives in part from concepts advanced by the post-structuralist philosopher Jacques Derrida. Another important, if not necessarily defining, text for deconstructivists is Complexity and Contradiction in Architecture (1966) by Robert Venturi. See also: Contemporary Art Movements: 1970-present; and also the Top Contemporary Artists: born after 1945. Deconstructivist architecture is characterised by surface manipulation, fragmentation, and non-rectilinear shapes which distort and dislocate architectural conventions concerning structure and envelope. It deliberately juxtaposes elements that appear to contradict each other in order to challenge traditional ideas of harmony and continuity - even stability! In short, deconstructivism challenges almost all traditional styles of building design. However, it is really no more than a series of postmodernist "impulses" rather than a coherent movement, or a consistent design style. Here are brief descriptions of ten of the most influential deconstructivist designs. An abstract assemblage of cubist and curvaceous forms, the museum houses one of the largest collections of furniture in the world, incorporating most periods and styles from the nineteenth century to the modern era. Frank Gehry's first building in Europe, created in cooperation with the Lorrach designer Gunter Pfeifer, the Vitra Design Museum is one of several architectural delights on the campus of furniture company Vitra. Consisting of two interconnected building units: the Cinema Block, with eight cinemas and seating for over two thousand viewers, and the Crystal, a glass shell functioning as a foyer and as a public square. Described by Coop Himmelb(l)au as "an urban passageway", the Crystal is also used as a venue for public functions, while its urban quality is enhanced by systems of bridges and stairs that provide views of people through layers of light and colour. This 11-storey groundbreaking structure with its cross-hatched facade of glass and steel is home to the "Books Spiral", a continuous 4-storey system of shelving which allows browsers to look through the library's entire collection without using stairs or traveling to a different part of the building. When it opened, the Spiral's bookcases contained 780,000 books, but were able to accommodate up to 1,450,000 books without adding to the shelves. This example of Shoah art consists of a unique zig-zag structure, encased in thin zinc sheeting punctured by windows shaped to symbolize wounds and scars, whose shape was inspired by a bent Star of David, and a jaggedness which represents the Jewish condition. A huge gap is carved through the museum, symbolizing the disappearance of thousands of Berliners who vanished in the Holocaust. Referred to obliquely as "weird" by China's President, this extraordinary example of deconstuctivist skyscraper architecture - housing the headquarters of Central China TV - is not a conventional tower, but a loop of six vertical and horizontal sections. Despite criticism it won an award in 2013 for the best tall building of the year from the Council on Tall Buildings and Urban Habitat (CTBUH). OMA, the Office for Metropolitan Architecture, was founded in 1975 by Dutch architect Rem Koolhaas and Greek designer Elia Zenghelis, together with Zoe Zenghelis and Madelon Vriesendorp. An original icon of deconstructivist design, the Parc de la Villette in Paris is characterized by a strange network of bright red structures designed not for relaxation but interactivity and exploration. With themed gardens, children's playgrounds and other facilities dedicated to science and music, it includes some 25 buildings, walkways, bridges, and landscaped gardens which were constructed over a period of fifteen years. This five-storey, open-air structure with its white faux scaffolding designed to make the whole structure appear to be a "work in progress", has no recognizable point of entry, and an interior said to induce nausea in some visitors due to the "colliding planes" of the design. In this sense, the structure remains one of the most uncompromising examples of deconstructivist architecture, elevating abstract theories above convenience and functionality. The Lois and Richard Rosenthal Center in Cincinnati - one of the best galleries of contemporary art concentrating on hypermodern painting, sculpture, architecture, photography, performance art and new media - is committed to staging exhibitions by postmodernist artists who encapsulate"the art of the last five minutes". Perhaps appropriately therefore, it was designed by the pioneering desconstructivist Zaha Hadid, the Iraqi-born British Pritzker Prize winning female architect. See also: Guggenheim Museum Bilbao (1997). Launched in 1987, completed designs for the project were submitted in 1991. Construction began in 1992 and finished in 2003, at a cost of $274 million. Composed of a series of non-rectilinear silver stainless curved cuboid shapes, the concert hall seats 2,265 people and serves as the home of the Los Angeles Philharmonic orchestra. It has experienced a number of technical problems. Christened "The Dancing House", or "Fred and Ginger", this extraordinary building next to the Vltava River won the Design of the year 1996 award from Time magazine, but did not harmonize well with the Gothic, Baroque and Art Nouveau structures for which Prague is famous. However after several years, it is now considered to be one of the most interesting buildings in the city. Its interior was designed by the Czech-born architect Eva Jiricna.  For more about postmodernist architecture, see: Homepage.